Vidhi Singh, 35, was surprised when her insurer stopped her health insurance policy. She was told at the time of renewal that the product had been withdrawn. Instead, she was offered an alternative policy so that she does not lose out on accumulated benefits. "I had no problem in shifting to the upgraded policy, but I found out that premium rates for the new policy were going to be much higher," she says. There are thousands of people like Vidhi who get notices that their health policies are being withdrawn. They are offered alternative policies that are expensive by 50-150 per cent. Can the insuRer suddenly stop your policy? According to rules, an insurer can withdraw or discontinue any product after seeking permission from the Insurance Regulatory and Development Authority of India and explaining the reasons for doing so. However, it has to offer customers a suitable alternative. There are many reasons insurers stop a policy. First, they are consistently making improvements in their products on the basis of market requirements and feedback from underwriters. Two, there is always a pressure to make the health insurance portfolio sustainable. Nikhil Apte, Chief Product Officer, Royal Sundaram General Insurance, says, "The regulator has asked all insurers to make underwriting profit on retail policies. Accordingly, we have withdrawn policies that were making underwriting losses and have shifted policyholders to upgraded policies." Another reason is cross-subsidisation. For the past few years, premiums for group insurance policies have been coming down sharply because of tough competition. This means retail policies have been subsidising group policies. S.K. Sethi, Vice President, Insurance Foundation of India, says, "In this competitive scenario, insurance companies, with a view to meet premium targets and improve market share, continue to offer lower rates for group policies to corporates. This means new products for retail consumers come with a higher premium. The retail segment is subsiding group policies." He adds the regulator should take a positive approach towards lakhs of families who are paying for health insurance from own pocket. Some insurers that recently withdrew health plans include New India, Oriental Insurance, United India and Royal Sundaram General Insurance. Whatever their reasons, such a move makes it difficult for the policyholder to decide whether to shift to a new policy or buy a new one from a different insurer. It is not an easy decision considering they can lose out on several benefits if they make a wrong move. We give you the lowdown on options before you when your health policy is suddenly discontinued. You can always migrate to the alternative policy offered by your insurer. The only catch is premium. It could be much higher than what you are paying for your existing policy due to price revision as well as addition of features. The main advantage of shifting is that your policy will not be considered as discontinued. This means you will continue to enjoy the benefits that have accumulated under the earlier policy. Lovaii Navlakhi, CEO of International Money Matters, says, "It is beneficial to avail of the upgrade." If you think you will not be able to pay the new premium, you can ask the insurer to reduce the sum insured. But considering rising healthcare costs and the fact that health insurance will become costlier as you grow older, it is advisable to retain the higher sum insured. Antony Jacob, Chief Executive Officer, Apollo Munich Health Insurance, says, "Every policy is unique and guided by an underwriting principle. Terms and conditions, as well as sum insured, medical check-ups, coverage of pre-existing diseases and waiting periods for various diseases are as per the applicable policy terms and conditions. We strongly suggest that once a customer takes an informed decision and buys the cover, he or she should read the policy schedule and wordings." The second option can be to discontinue the policy and buy a new one from a different insurer. This is not advisable as you will lose out on benefits that you have accumulated in your existing plan over the years. For example, health insurance policies have a waiting period of four years for pre-existing illnesses from the year the policy is bought. If you buy a new policy, you will again have to go through the four-year period for coverage of pre-existing illnesses. Even if you have completed two years with the present policy, this period will not be counted, and you have to start afresh. Besides, you will not get cumulative bonus if you buy a new policy. Anil Chopra, Group CEO & Director, Bajaj Capital, says, "Companies are allowed to amend the terms only at the time of renewal and not before the expiry of the policy period. Customers are given time to decide whether they wish to continue the plan with enhanced features and premium or not." 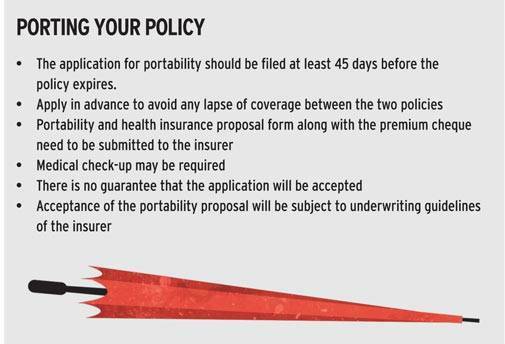 Portability means one can transfer his/her policy from one insurer to another without losing the waiting period benefits. However, before doing so, you must consider the tenure of the waiting period, as it differs from company to company. For example, if the existing policy has a waiting period of two years for a medical condition and in the new plan the waiting period for the same condition is four years, you will have to wait for two more years to get that illness covered. However, porting a policy is easier said than done. Sethi says it happens more easily if the patient has not had any medical issues during the tenure of the earlier cover. This option is closed for those who have pre-existing diseases. "Those who have lodged a claim in recent years are not preferred by insurance companies under the portability clause. Those who suffer from a critical disease are definitely not accepted," says Sethi. Experts say while waiting period benefits can be easily transferred, accumulated bonus transfer is subject to limitations. Moreover, pre-existing diseases and treatment received for illnesses during the tenure of the first policy are subject to fresh underwriting. Navlakhi says, "Basically, during porting, pre-existing illnesses come under fresh scrutiny, besides the amount of bonus that can be ported to the new company/product, depending on the provisions of the new product." Documentation is another issue. Navlakhi says most companies insist on submission of all documents of the existing policy as they would like to see if any claim has been filed in the past. In the event all policy documents are not available, at least last four years' documents are sought. Moreover, insurance intermediaries are not given commission during the first year of portability and, therefore, do not have an incentive to provide service to the policyholder. In the end, every policy is different and each insurance company is governed by its underwriting principles. Take an informed decision.